Do you ever stop and think about whether your life is ‘balanced’? I didn’t even really know what life balance meant until I had a chat with an amazing counsellor who taught me the importance of taking stock of what you do with your spare time and whether you need to rebalance your life. Sometimes in times of stress or periods of anxiety or depression, our instinctive coping strategies are actually counter-productive; burning the candle at both ends, long periods watching TV, bingeing on junk food or booze, or retreating into your shell and avoiding family and friends. Not sure where to begin assessing your life balance? Have a think about how you’d categorise the gym, a manicure, or a stand-up comedy show. If none of these are your scene – perhaps you are more likely to walk the dog or go to the cinema – then tweak your list to best suit you. You might find that some of the activities overlap between categories; e.g. going for a massage can be both Relaxing and Pampering. 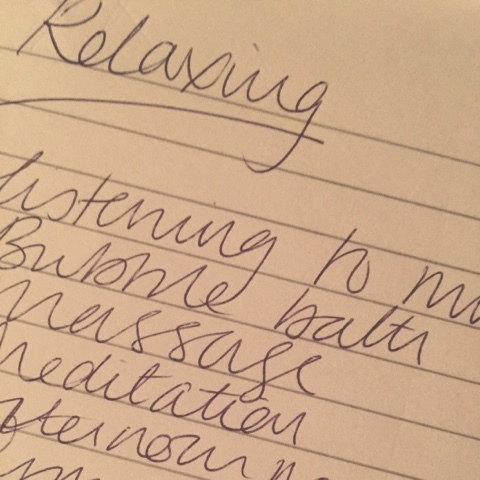 When I first did this exercise my Relaxing and Pampering lists were very long, it seemed I was very adept at long lies in, eating cake and enjoying spa treatments. I wasn’t so good at getting out and doing stuff with other humans. If you find your lists bring out a little too much of the comfy hermit in you, or perhaps suggest you’re running out of candlewax to burn, then it’s a good idea to add to your lists the kind of activities that you’d like to incorporate into your life to restore some balance. I had to force myself to add things to my list that were Energising. I’m not a sporty type and couldn’t see past the horrific images of snowboarding or going for a jog – both of which I’d list further down than setting my own hair on fire as an idea of a good time. Eventually I realised it doesn’t have to be very energetic to be energising. It doesn’t have to involve wearing a sports bra, panting like a Labrador, and turning puce in the face with exertion. I added activities like taking the kids to feed the ducks, going to a food festival or Christmas market, visiting friends instead of just emailing. Bit by bit, I introduced more fun and energy into my life, and started to restore my life balance. In the busy real world with work and bills and family and housework, it’s unrealistic to expect anyone to fit in a facial, a dance class, meditation and a trip to Alton Towers into a typical day. But if you keep track of how you spend your spare time – maybe over the course of a week or month – and make an effort to make time for relaxation when you need it, and also have some fun when you need it, you can rebalance the areas that need attention. What do you like to do in your spare time? Do you feel like you achieve a balance in your life?